What better day to post a book review than on World Book Day! I hope you (well, the kids!) have all had a fun day dressing up. I was recently contacted about reviewing new releases in a book series, Blue Kangaroo by Emma Chichester Clark. They are suitable for ages 2-5 so C is target age. How could I say no? 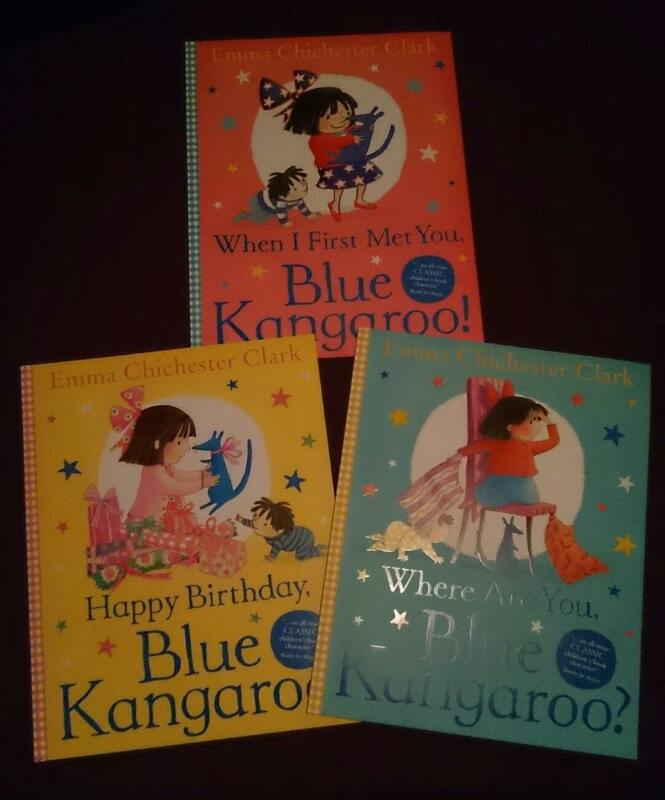 We received all three new books in the series; When I First Met You, Blue Kangaroo! ; Happy Birthday, Blue Kangaroo! and Where Are You, Blue Kangaroo? 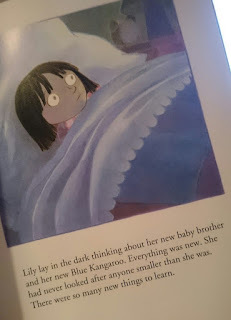 All of the books focus around a little girl called Lily and her blue toy kangaroo. In the first book, When I First Met You, Blue Kangaroo! we learn just that - how they met. Lily's grandmother gifted Blue Kangaroo to Lily when her little brother Jack was born. She soon discovered that it isn't easy looking after a tiny baby so she can practise with Blue Kangaroo. She goes through some trial and error situations but they love each other instantly. 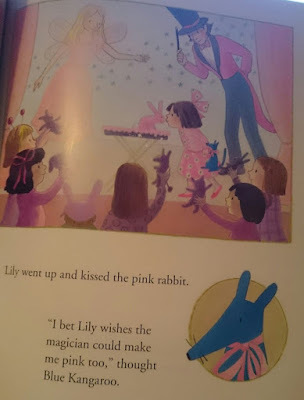 I love this book as a mother because Lily gets a bit upset that she can't do everything as well as her mum can but mum reassures her that she made mistakes when she first had Lily - something that I can relate to! Parenting is all about learning. In Happy Birthday, Blue Kangaroo! both Blue Kangaroo and Lily are celebrating their birthdays on the same day and are having a party. Lily, like a typical girl, wants everything to be pink from the food to her dress and the wrapping paper that her friends bring. Blue Kangaroo feels a little bit pushed out because he's blue and not pink so he thinks that Lily doesn't like him as much because of his colour. When she realises, Lily soon reassures him and makes him feel happier. I think this was C's favourite of the three books. He felt quite sorry for Blue Kangaroo and kept telling me that he was sad. He was pleased with the happy ending though. Where Are You, Blue Kangaroo? 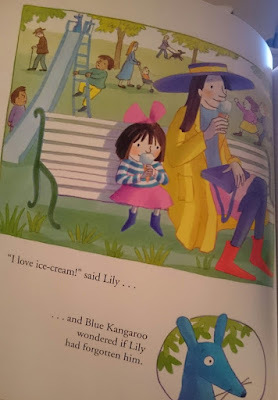 reminds me a little bit of days out with C. Lily goes out with a few members of her family over different days and always brings Blue Kangaroo along for the trip. Sometimes she gets a little forgetful and leaves him somewhere then can't find him! She always ends up finding him again but Blue Kangaroo gets scared that one day she won't come back for him. As I read this story to C, I made a point of saying "That's why you always need to hold onto your toys tight because you'll lose them" and he kept nodding so I think it sunk in that if he loses a toy, it's lost for good. 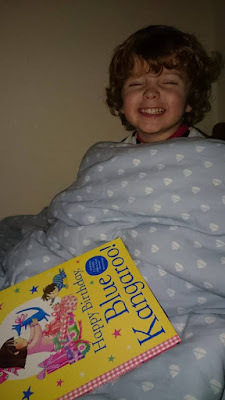 Since we received these books, C has always asked for "a blue kangaroo book" at bedtime so he's taken to them quite well. They're a little longer than his usual books which is great, I love that we're moving on from toddler books and getting into something a bit older. The length doesn't bother him, he'll sit through the entire story listening intently. I think this is the first book series that he's owned and he likes hearing about Blue Kangaroo having different adventures. There are nine in total and because of C's love for them, I think I'll have to get my hands on the rest! Each book retails at £6.99 and they are published by HarperCollins. You can find them at all good high street bookstores and online.